Winchester is raising its game this year as pressure for the title of England’s Christmas Capital continues to spark debate across England. A range of festivities are in the pipeline to put Christmas centre stage once more and help make it a memorable Christmas for residents, businesses and visitors alike. It’s estimated that over 300,000 people will come to the destination to enjoy the unique shopping opportunities and a host of stylish seasonal events. Preparations for the season are well under way, masterminded by Winchester Cathedral, Winchester BID, Theatre Royal Winchester, Winchester Discovery Centre, Marwell Wildlife and Winchester City Council. The fun starts on Thursday 14 November with Winchester BID’s Christmas Lights Switch-On. This annual community highlight attracts over 6,000 people every year – at 6pm 25,000 sparkling white lights will illuminate the streets drawing the crowds up the High Street and down the lanes for the first late night shopping evening of the season. Winchester BID has arranged for Breakfast DJs Gillies and Emily from Capital South Coast to host the evening, with a live DJ set and the Capital Street Stars spreading the Christmas cheer among the crowd. The evening will also showcase a line-up of local community talent plus characters from the Theatre Royal’s pantomime – and this year there is also an added element of surprise. The event is sponsored by local company Denplan, the UK’s leading dental payment plan specialist. 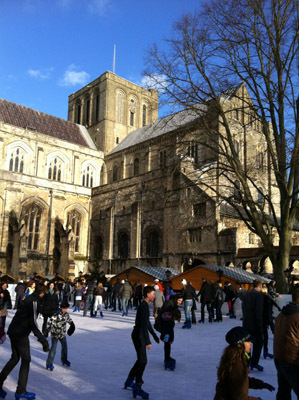 Winchester Cathedral catapulted the city to seasonal stardom in 2006 with the launch of the Christmas Market and open-air real ice rink. In this, its eighth year, the market runs from 21 November to 22 December. For the first time, and in response to its building popularity, the much-photographed Lantern Procession has its own family-focused night. This year the date is set for Thursday 28 November at 6pm, culminating in a gathering in the Outer Close (Cathedral Grounds) at 6.45pm where 50s’ band The Cadillacs will headline the entertainment. The colourful paper lanterns, made from willow and tissue paper, are made by families at supervised workshops during the preceding weeks in the Brooks Shopping Centre. To find out more please contact: Jacqueline Rolls, Winchester Lantern Parade Coordinator at info@jaxsarts.co.uk. Christmas wouldn’t be Christmas without a sprinkle of snow and Winchester Discovery Centre will be bringing A Very Snowy Christmas to the City. The best-selling book by author Diana Hendry and illustrator Jane Chapman has been brought to life by touring theatre group Blunderbus. With live music, beautiful puppets and a stunning snowy set which comes to life before your eyes, this charming festive tale, perfect for little ones, will warm of the cockles of your heart. For latest information see http://www3.hants.gov.uk/wdc or call 01962 873603. One of our best-loved fairy tales is given the Theatre Royal pantomime treatment to create a show that’s exclusive to Winchester and full of magic. When Snow White escapes the clutches of her evil Stepmother she encounters seven crazy dwarfs and original music, jokes and audience participation follow. Snow White and the Seven Dwarfs is a Christmas treat for all the family and runs between Wednesday 11 December 2013 and Sunday 5 January 2014. Visit www.theatreroyalwinchester.co.uk/snow-white or call (01962) 840440 to book your ticket today. Over the last four years a winter wonderland has been developing at Marwell Zoo with increasing numbers of families flocking to join in the fun. Visitors to the Zoo can pop in to see the elves in their toy factory at Marwell Hall, warm themselves with festive treats and follow Mrs Claus for the classic festive tale of The Night Before Christmas. Step into the elf workshop to decorate your own festive stocking before being called to meet Santa in his grotto and receive a special gift in what promises to be an enchanting Christmas experience. Book your tickets online at http://www.marwell.org.uk/christmas/ to be sure of joining in the fun. No Christmas in Winchester is complete without indulging in the city centre shopper’s paradise. Wander up the High Street to find familiar national retailers alongside a tempting array of independent shops, award-winning restaurants, bars, inns and cafés. The many speciality shops in the medieval lanes of the city offer a chance to pick up that ‘something different’ gift for a loved one. Finish off your day with a steaming glass of mulled wine and a handful of roasted chestnuts by the Christmas tree. Against the backdrop of a medieval City decked in its Christmas finery with the cathedral’s seasonal services at its heart Winchester is no doubt the nation’s Christmas capital and is set for the warmest of Christmas cheer. See www.christmasinwinchester.co.uk for the latest special offers on accommodation and meals out and further information.